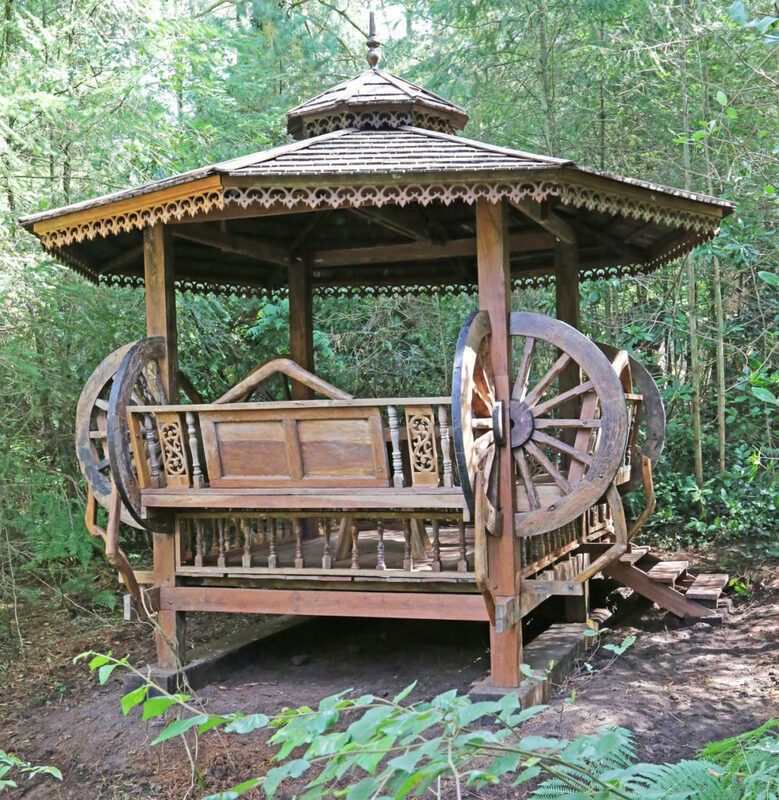 The Sculpture Park is a sculpture-packed oasis nestled within 10 acres of lakes and woodland in the Surrey Hills. The Sculpture Park is home to a wide variety of local wildlife, and of course a multitude of Modern, 20th Century and Contemporary sculptures. A popular tourist destination, the unique combination of atmosphere and art appeals to all. As well as being a great place to visit, with plenty to do and see, the Sculpture Park is a leading supplier of sculpture to private, corporate and public buyers. The park is a meandering maze with over 2 miles of lush forest paths, lakeside tracks dotted with hidden treasures and towering monuments. To help navigate the Sculpture Park, a map is included in a free guide provided at the start of every journey. 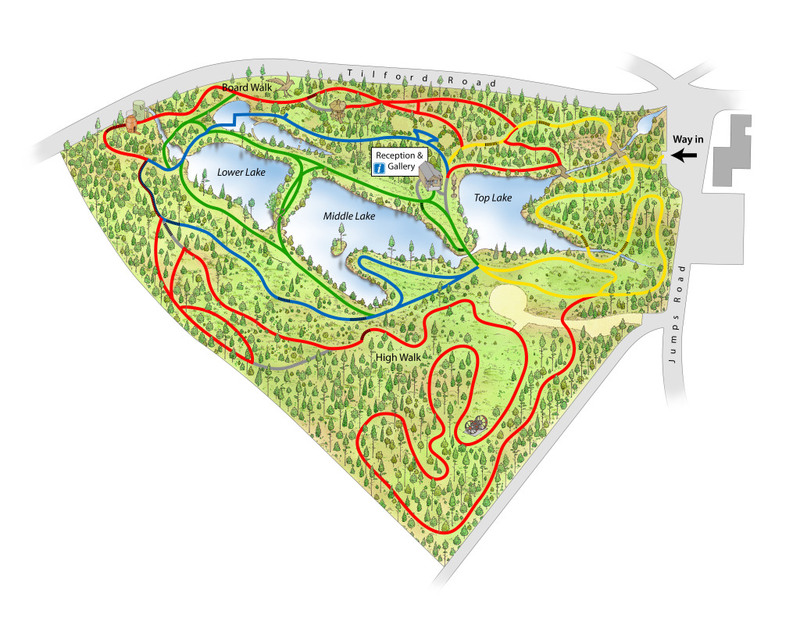 The trail is split into four coloured parts: yellow, red, blue and green. Coloured arrows line the paths and help guide you through the collection. You don't have to follow the coloured trails if you don't want to, they are just there to help you work out where you are- and if you can't see it all in one visit, where to carry on from when you come back! 2. Take some of the magic home! The Sculpture Park can be enjoyed by anyone, and is a magical place to visit- but for those who want to take some of the magic home, almost all of the pieces in the collection are for sale! There is a huge variety of sculpture for sale with pieces of all shapes, sizes and styles to suit any indoor or outdoor space. Experts are available to advise on choosing the perfect piece, and the delivery and installation of works. 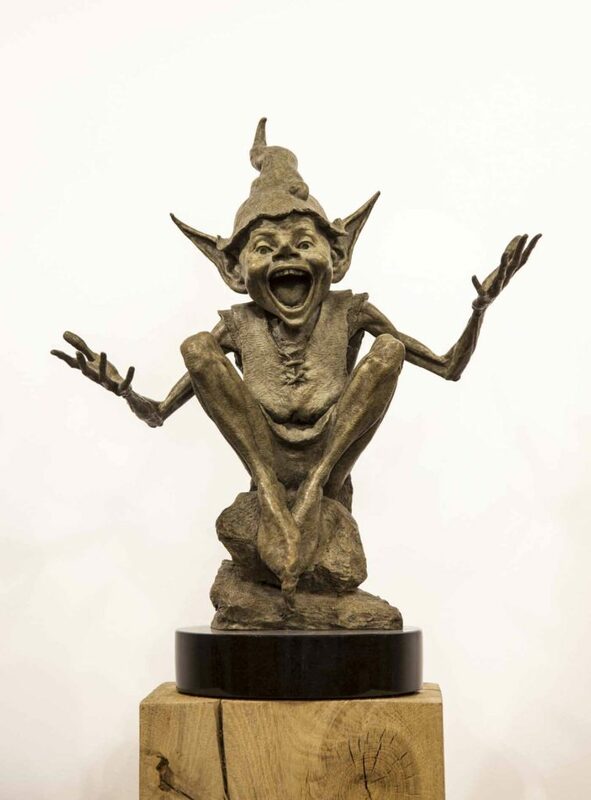 You're bound to see something you love whilst exploring the park, and with a huge variety of sculpture available to suit most budgets and tastes, why not make an investment in something you'll treasure for life! 3. Play a game...Priceless or Pricey? Inside the free guide provided at the start of every journey through the park, there is information about every piece- who it's by, what it's called, what it's made from and the price. Given the subjective nature of art, what could be seen as priceless to one could be worthless to another! An ever popular game is to explore the park, pick a piece, and see what people think of it- the more disagreement the better! Next, guess how much the piece is worth! People always marvel at how far off or or how close they get to the correct answer, and how much it differs from piece to piece! Sculpture is such a unique, subjective and emotional medium that beauty - and value- most certainly lie in the eye of the beholder. And once you've guessed the price, take a look at another piece, and play another fun game...guess what that one is called! The Sculpture Park is a magical place, and as such has attracted a few mythological beasts, and a number of dragons in particular...(Some Welsh heritage via the owner also helps). Two red Welsh dragons can be found guarding the gates to the park, and as well as that the world's largest horseshoe sculpture - a colossal 300 tonne dragon! 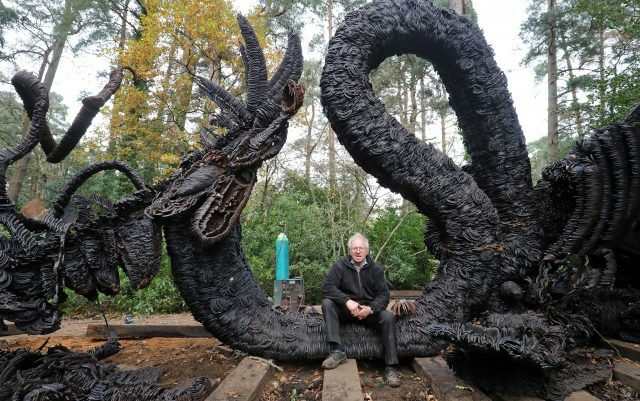 As well as these dragons, all manner of other mythical beast sculptures have made their home amongst the woods and lakes of the Sculpture Park! Enter the mineshaft if you dare! Continuous contact with left hand wall, avoiding vertical drops, should ensure your safe passage through the shaft. Be quiet to avoid disturbing the bats – a protected species. Dotted around the park, hanging from the branches of towering pines are a number of wind chimes. Some giant, some small, each one can be caught in the wind (or given a gentle push) to get it singing... Each one, tuned to the Quartal scale produces a series of beautiful musical notes that echo and sing between the trees. 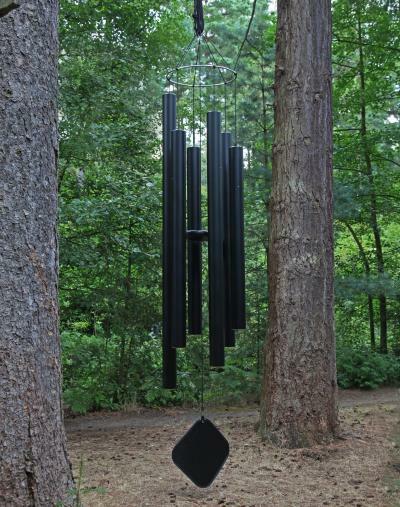 The calming, peaceful sounds of the chimes add a beautiful layer to the birdsong and trickling streams that make up the relaxing sound scape of the Sculpture Park. You are very welcome to bring a picnic to The Sculpture Park. We have many tables and benches scattered around but also two wonderful Thai Pagodas which make the perfect location for a posh picnic for up to 9 people (12 if you’re close friends). For those without a packed lunch, you're more than welcome to pop out of the park and return later on the same day to finish your journey. We're nearby to the Bel and Dragon pub and 2 minutes from The Orchard Barn Cafe, but there are plenty of other great pubs just a short drive away! 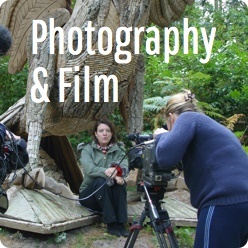 Described by many as a ‘photographers dream’, you would be forgiven for kicking yourself if you forgot your camera. From towering abstract works to sculptural benches and views of the park, every corner brings a new and exciting photo opportunity. We are very happy for you to share your snaps on social media. 9. Meet the resident doves. 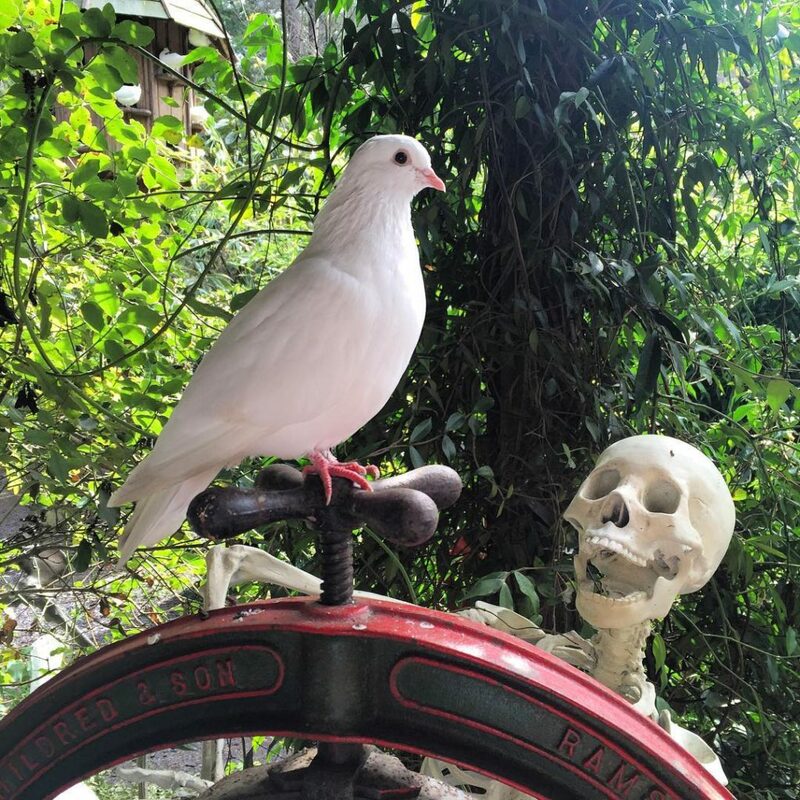 Although partial to a quick trip to the pub, we are home to a bevy of friendly doves who like to photobomb at any given opportunity. 2015 saw the introduction of our indoor gallery, exhibiting around 200 interior works of affordable art as well as investment pieces. The gallery compliments our outdoor trail, with many pieces created by our favourite artists found on the trail including Ruth Moilliet, Maria Bayardo, Ferri Farahmandi and David Goode. And on a cold day, it makes a great place to warm up once you've been around the trails! This entry was posted in and tagged Buy Sculpture, sculpture for sale, Things To Do in Surrey, Things to do at The Sculpture Park on 21st February 2017 by Charlie.